One of the most recent Orangery Solutions installations incorporated the latest in modern design concepts with the inclusion of a number of sets of bifold doors. The entire 8m x 4m project was tailored exactly to meet the needs of the homeowner and to complement the appearance of the existing property. The advantages of incorporating bifold doors into the orangery extension were numerous bringing more light to the completed project and the overall impression of more space which the owners required. Unlike traditional options the bifold doors were the preferred choice for the prestigious private home in Lytham St Anns, Lancashire due to the dramatic effect they would add once the project was complete. To avoid structural issues at a later date the Orangery Solutions team provided structural calculations to ensure that the orangery structure could cope with the additional load bearing requirements that would be needed to accommodate bifold doors throughout the entire extension. Calculations for the orangery were carefully analysed and prepared by the company’s in-house structural surveyor at the planning stage alongside the architect and building company. Paul Nellis, Managing Director at Orangery Solutions comments, ‘Installing bifold doors into an orangery project is simple and easy. However, when it comes to the overall stability of the doorframe, this can cause technical problems at a later stage if calculations have not been made accurately. Not only can the doors come right off the tracks and out of the frame should warping occur but the weight of the frame can have a structural impact if calculations are not accurate. 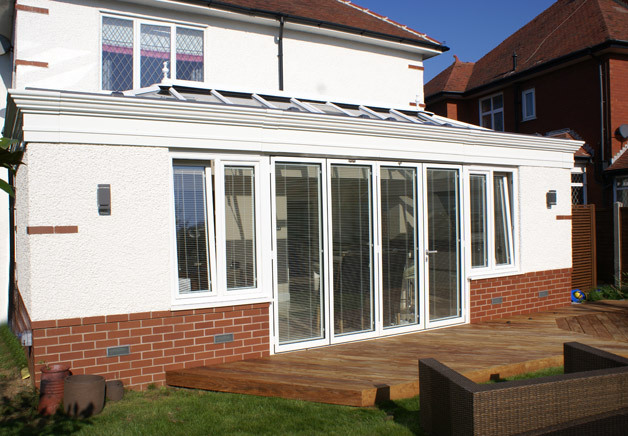 Orangery Solutions provides a patented cassette system with integrated steel legs giving many structural advantages over alternatives as well as professional structural guarantees which are provided by the company on all projects.